On this journey discover some of the most beautiful islands in the Galapagos. This itinerary will take you to the true origins of the archipelago. A world only recently created by the titanic tectonic upheavals of our Earth’s crust. A volcanic hotspot formed the islands in a blink of an eye in geological time. Fernandina Island is regarded as one of the most pristine island environments anywhere in the world. Life has evolved here in its natural state, far from the intervention of man. 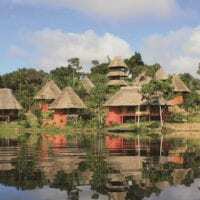 From the west, we venture back to the Central Islands, landing at the intriguing red beach of Rabida, seeking out the land iguanas of Cerro Dragon. On Santa Cruz, visit the Charles Darwin Research Station and get up close to giant tortoises in their natural environment. In the south, spot flamingos and snorkel at one of the best sites in the archipelago: Champion Islet. A sophisticated, upscale travel experience for 48 guests in 24 outside cabins that combines modern design, spacious rooms, and gourmet cuisine with top adventure. All cabins have air conditioning and private facilities. The three public decks include an ample bar-salon, dining room, natural history library, sky bar and sun deck. A Jacuzzi and gym complete the on board amenities. Also included in your cruise cost are the use of snorkelling equipment, kayaks, wet suits, and excursions on a glass-bottomed boat. 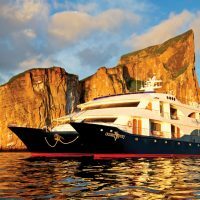 Navigate in this luxurious cruise and admire firsthand the wildlife in the Galapagos Islands. 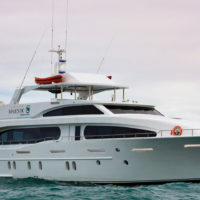 Cruise the Galapagos western islands including North Seymour, Isabela, Rabida, Fernandina, Santa Cruz and Floreana. Plenty of opportunities to snorkel, kayak and enjoy boat rides on the glass-bottom boat. Admire the incredible life under the sea, while snorkelling with Rays, Sea Turtles and Sharks. Get to see the Flightless Cormorant, Nazca & Blue Footed Boobies, Frigatebirds, Galapagos Hawks, Land, Marine and Hybrid Iguanas, Galapagos Sea Lion, Galapagos Giant Tortoises, Galapagos Fur Seal, Galapagos Penguin & American Flamingo among other species. Visit Santa Cruz, North Seymour, Isabela, Fernandina, Rabida and Floreana Islands. 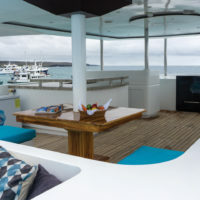 Your Galapagos Cruise includes: Accommodation in selected cabin, all meals, Island sightseeing, Naturalist guides and lecture services in English, snorkelling gear, medical care on board (not including the cost of medication), shared transfers in the islands and from main hotels in Quito and Guayaquil. Please remember that the exact route and program may vary according to weather, ocean conditions and the wildlife we encounter. Dry landing: guests disembark the dinghy onto rocks or a dock. On arrival, you will be met by a representative and transferred to the dock to board Yacht La Pinta. There’s a welcome introductory briefing, boat drill, cabin assignment and then lunch. Following an afternoon disembarkation, enjoy a walk along the coast and the interior of this beautiful flat island, observing numerous bird colonies as well as Sea Lions and Land Iguanas. There are opportunities for coastal exploration by dinghy. Evening briefing, welcome cocktail and dinner. Since there is no landing site at this location, the coastal exploration is by panga, while the naturalist guide explains the dramatic geology of the area, with remains of lava flows and tuff stone layers. There is abundant wildlife and, depending on the conditions of the ocean, you will be able to snorkel along the cliffs, hopefully in the company of Green Sea Turtles. In the afternoon, visit the youngest and most pristine island of the archipelago, Fernandina, one of many visitors all-time favourites. Punta Espinoza has an amazing combination of barrenness and abundant wildlife. Highlights include hawks, penguins, flightless cormorants, and astounding views of the surrounding volcanic landscapes. After breakfast, disembark at Urbina Bay, on the western side of Isabela Island, the result of an uplifting of the ocean floor. Here you can see corals, shells, and large and very colourful Galapagos Land Iguanas, as well as (occasionally) Giant Tortoises. Navigating the Bolivar Channel, there are good chances of spotting several species of whales. On the north-west of Isabela, secluded Tagus Cove provided a favourite anchorage for pirates and whalers over the centuries. This is surely a great visitor site. An uphill hike takes you to the back of Darwin Crater, a pit filled with salt water. You can snorkel or ride kayaks amid the dramatic landscape before going on your hike. Disembark at Rabida Island’s red-coloured beach. A stroll along the beach allows you to observe Marine Iguanas, Mockingbirds, Yellow Warblers and several species of Darwin’s Finches. This is a great place to snorkel from the beach. For non-snorkelers, you can ride the glass-bottom boat for an exploration of life underneath the waves. The north shore of Santa Cruz hosts the fascinating landscapes of Cerro Dragón (Dragon Hill). Your walk includes circling a salt water lagoon frequented by lagoon birds, while further inland, the trail offers a beautiful view of the bay and the western islands of the archipelago, as well as the chance to observe Land Iguanas. This morning, you will visit the Charles Darwin Research Station. Many Giant Tortoise resides in this impressive cactus forest. These are the Galapagos’ headquarters of scientific investigation, conservation, and the National Park administration. A delicious lunch is served at the pool side of the Finch Bay Eco Hotel. After lunch, head up to the highlands of Santa Cruz Island by vehicle. This is a great place to look for the emblematic Darwin’s Finches and the endemic Scalesia trees. The highlands are also great for exploring the exuberant vegetation where Giant Tortoises roam in the wild. This will surely be one of the most remembered visits of the whole voyage. After breakfast, panga ride along the maze of channels on Floreana’s north shore. Follow this visit by continuing to Baroness Cove with its breathtaking views of Floreana. Land at Post Office Bay to visit the historic barrel that has been serving as a post office in the archipelago for over two centuries. Kayaking at Baroness Cove. Back onboard for lunch. Before disembarking at Punta Cormoran, you can snorkel or ride the glass-bottom boat along the coast of an extinct cone called “Champion Islet”. Later in the afternoon, your visit to Punta Cormorant takes in an olivine-crystal beach for an easy walk by a brackish water lagoon where bird species like greater Flamingos may be observed. On the other side of the island, you will come to a white-sand beach where Sea Turtles come out at night to nest. Day 7 Santa Cruz Isl. Today, you will be transferred to Baltra airport for your ongoing flight.